So onto the 2nd installment of this little blog series. I even have a logo now! Hop contracts are by and large a very good thing. A hop contract is a piece of paper that you sign that commits you to taking a certain volume of hops over the course of the year. There are a number of hop merchants that you can contract with and we frequently use Charles Faram as they tend to have the best range of available hops. It is vital for most breweries to guarantee the supply of interesting American/New Zealand/Australian hops that are so prevalent in current beer. It is also very useful if you contract at least 500kg for the year... At that point Faram's will store the hops for you allowing you to draw down from the contract without having to either store the hops yourself or pay for all the contracted hops upfront. To put this into perspective, our hop contract for this coming year is in excess of £40,000 and is over two tonnes of hops, not something we have the money or space to deal with all at once. However, the availability of hops is always a hot and stressful topic at the brewery. Andy Parker sums up some of my thoughts nicely in his blog here. We in the UK only get the stuff that is left when the growing US craft scene has had its fill of the best of them. Back before we started the brewery we knew that some hops would be very difficult to get hold of. Certain hops like Sorachi Ace and Nelson Sauvin are hoovered up in such large quantities by the bigger, more established breweries that they are almost impossible to get hold of unless you have a record of using them. If you are a start up you can't have such a record so you are left feeling that there is no way in. It took a lot of begging and buttering up the guys at Faram’s to get the small amount of Sorachi we did manage to get in the first year. We still can't get hold of any Nelson for love nor money. Even when you have a contract, this is no guarantee of supply. Hops are regularly shorted (a situation where the hop merchant gets only a percentage of their order and they pass this shortfall onto the brewers). Even when the hops arrive into the country can be a bit of an issue. Currently we are being told that there are no Simcoe pellets available, even though we have them on contract, that they have not arrived as yet. Not arrived! Hell, they were harvested 9 or 10 months ago... how long does the boat take to get across the Atlantic? The biggest bugbear this year is the availability of Citra. 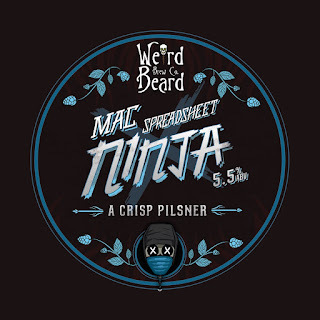 Citra is our biggest usage hop accounting for about 25% of all the hops us we have on contract and the instrumental hop in Mariana Trench, our best selling beer, and Faceless Spreadsheet Ninja. Unfortunately it is a very popular hop with other breweries so the demand is large. This year for some reason, perhaps there was a lower yield on the citra crop, or one of the big US brewers decided they wanted a lot more but Charles Faram received only 70% of their expected ration. As such, they passed this shortfall onto the brewers so we only got 70% of the citra we were expecting. So how does a ninja deal with this kind of bump in the road? As you may expect we were sensible enough to order more Citra than we needed, particularly the pellets we use for dry hopping. This got us through the start of the year. 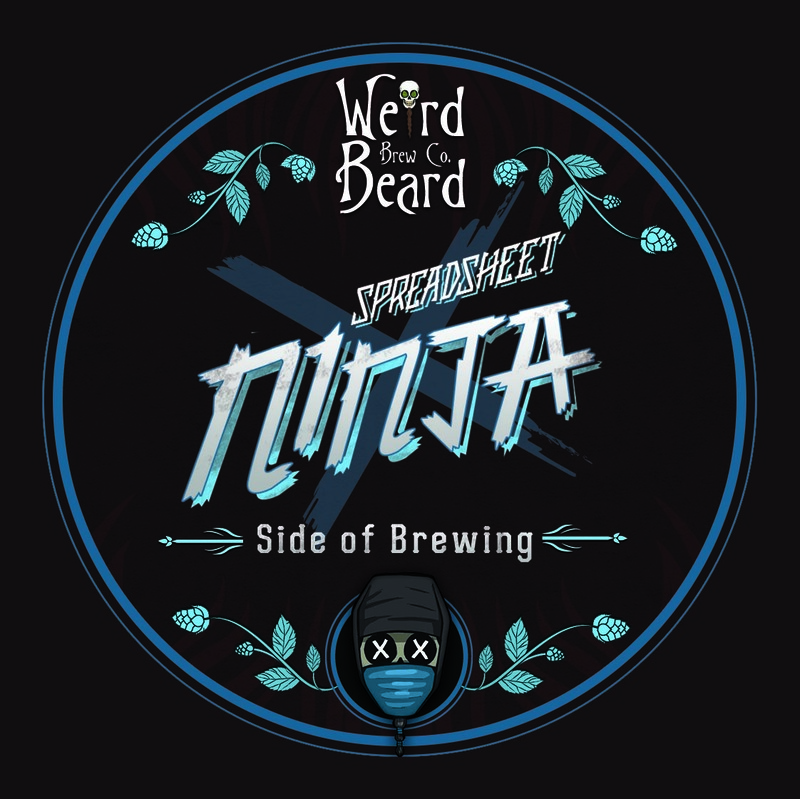 Faceless Spreadsheet Ninja in concept was a single hop Citra but as soon as we were shorted we changed to Magnum for bittering, which also allowed us to keep the price down slightly. We had to make a sacrifice, we had to ninja the Ninja. We had to come up with the “Variations on a Ninja” series. So what are the Variations on a Ninja series? 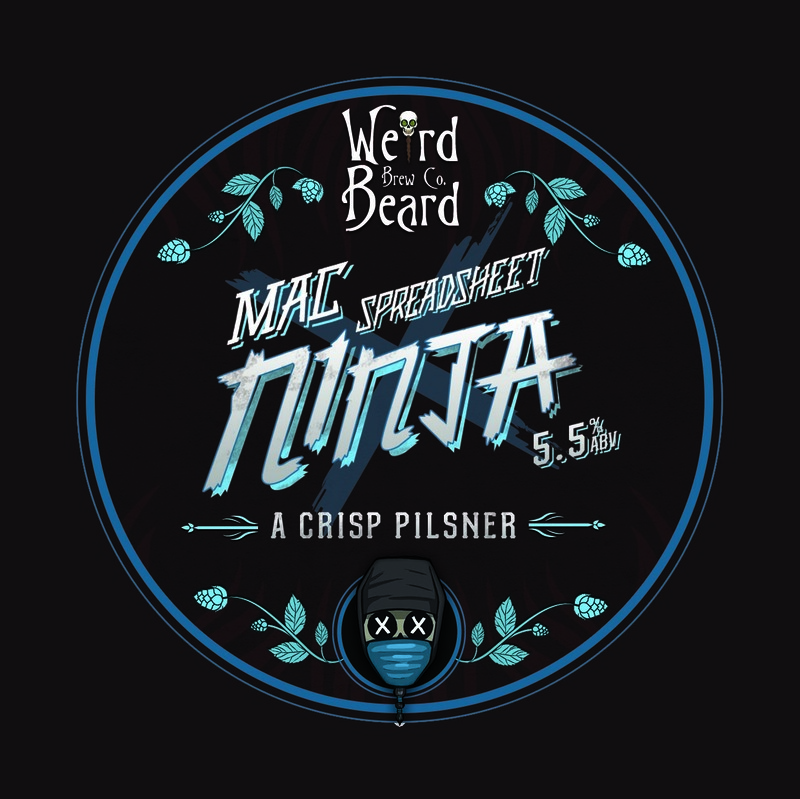 First up is MAC Spreadsheet Ninja, almost ready to release, perhaps a play on the Apple Mac where this Ninja first encountered spreadsheets. It uses Mosaic, Amarillo and Centennial and is less tropical than the Faceless version but its crisp hoppiness put a very big smile on my face. 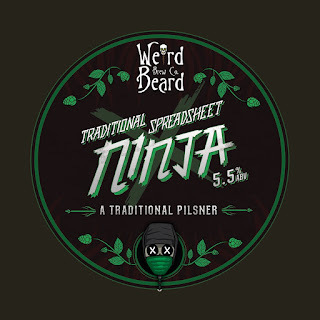 The second variation is Traditional Spreadsheet Ninja, this is lagering away in the fermenter at the moment. It uses the Saaz hop, which you all will of course know is traditional in Czech Pilsners. Even if our brewery water treatment brews more German style pilsners, it is currently tasting great from the fermenter, so expect to see it in a month or so. 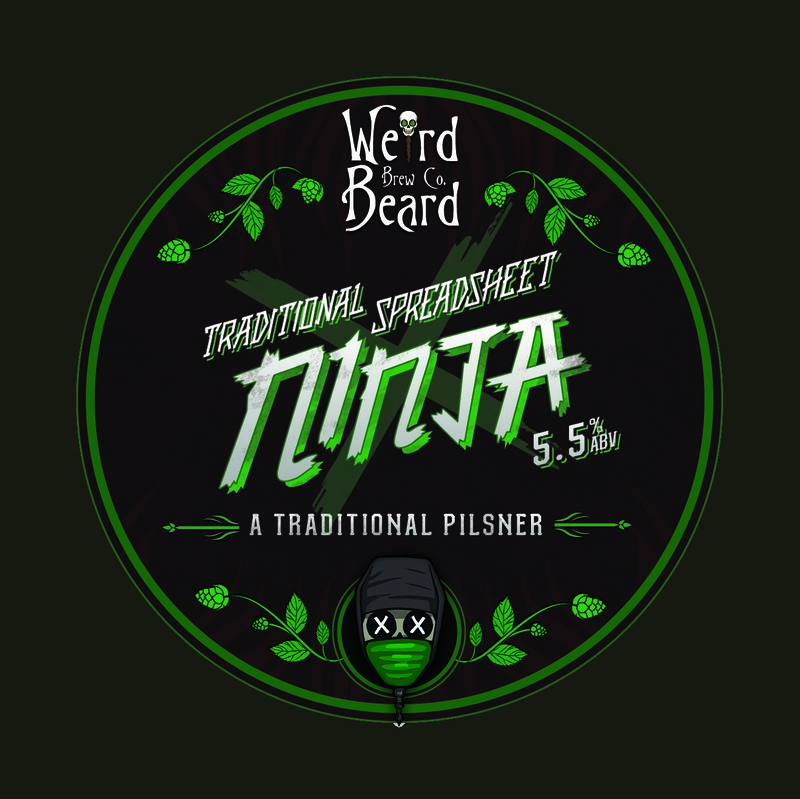 We have other ideas, Experimental Spreadsheet Ninja using Experimental 431 as the hop and Faceless Wordprocessor Ninja with Aurora, Bobec, Celia and Dana hops. 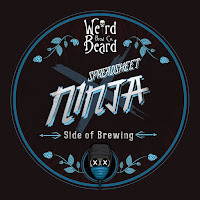 Whether these get brewed, this ninja can't really say.